Because of a terrible internet connection the first post after Kilimanjaro wasn’t exactly what I was hoping for in terms of content and especially photos, so I thought I’d do a follow up with a few random thoughts and some pictures. Wireless has been out my first two days in Cape Town as well so I’m trying this from an internet cafe’ … travel and technology, not the best of bedmates. My first two nights in Tanzania were at the Mount Meru Game Lodge, a fine and peaceful place. Three others from our climbing party were there also: Ken Lee, a 25-year-old financial manager who is the process of moving from New York to Boston; and Russ and Brent Wilde, father and son from Australia (Russ is originally from New Zealand). Great guys all, and the four of us ended up sharing a vehicle on safari as well. Flying into Kilimanjaro with a 7:45 p.m. arrival I was hoping to get a glimpse of the mountain out of the plane, but it gets dark much earlier in Tanzania because of proximity to the equator and no daylight savings. But everything went smoothly upon arrival, and I had a solid night’s sleep. When I walked outside my room the next morning there were five or six zebra grazing 50 yards away, an ostrich taking a drink out of a pond, and about half a dozen monkeys chattering away on the roof of the adjacent building. It was a pretty good “you’re not in Kansas anymore” moment. Because of clouds and fog we did not see the mountain during the first two days of hiking. We spent a very cold second night at our camp on the edge of the Shira Plateau, and when we emerged from our tents in the morning, there it was: huge and intimidating, and still so far away! For the next three days, as we walked across the plateau, up into the rocks and toward the base of the Western Breach, that mountain was always in front of us, always breathtaking, impossible to ignore. I think it helped give everyone a sense of purpose, and it seemed that the closer we got to it, the less intimidating it became. 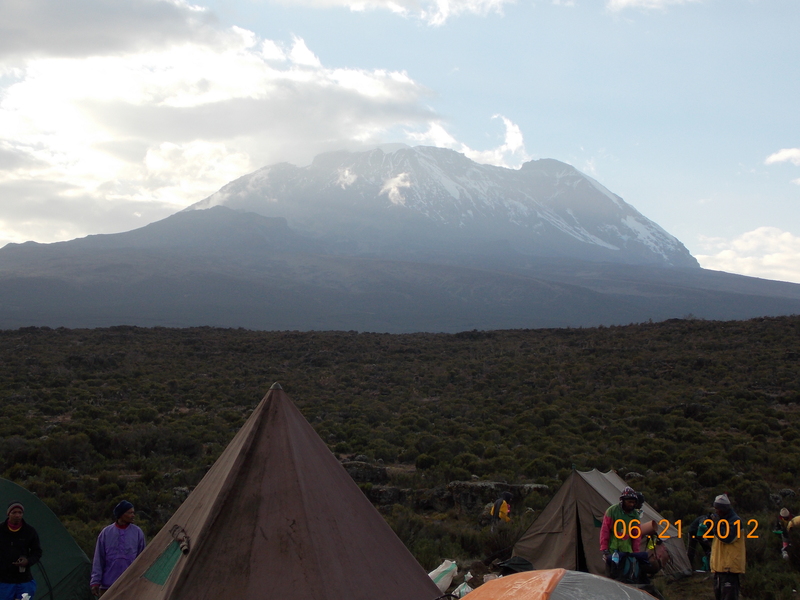 Kilimanjaro is not really the mountain’s name: it’s Kibo. Kilimanjaro is the name of the National Park, an enormous area that once enclosed three great peaks: Shira, Kibo and Mawenzi. Shira erupted 750,000 years ago and collapsed, forming the plateau that we crossed on the third day. 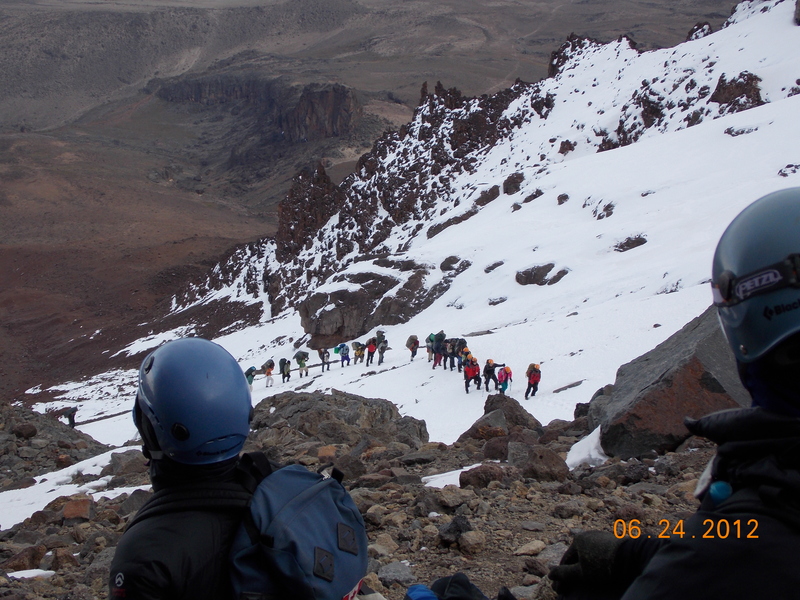 Mawenzi erupted at some point and just stopped growing; we saw it on the way down, a craggy and uninviting 16,000 feet. Kibo is still technically an active volcano, last erupting 1.2 million years ago. Why that name doesn’t get the billing it deserves as the largest free-standing mountain in the world and home to Uhuru Peak, the highest point in Africa, I don’t know. It’s probably Hemingway’s fault; The Snows of Kibo just doesn’t have the same lyrical ring to it. In the first post I mentioned the porters and guides and their amazing work, but I didn’t get into all the little things they do on a daily basis in support of the climbers. They were ever encouraging, greeting us as we walked into camp each day with high fives, singing their songs, saying “jambo, karibu” (hello, welcome), always smiling, always positive about what you had done that day. Our leader Lema Peter’s cousin Emanual (“Ema”), who had the critical job of being in charge of water, was certainly the most vocal and outgoing (“loudest one in the family” said Lema), and was constantly coming up to you with a huge smile: “Gooda job, Babu, gooda job!” He was wonderful. They clearly love what they do and feel fortunate to have these jobs. Their generous spirit and their good humor are infectious, and very uplifting as the climb gets more intense. But there are 120+ different tribes in Tanzania, each with its own language and beliefs. Lema told us the story of arriving atop the Western Breach on one trip to find a dog and a bunch of freaked-out porters. A few of the tribes evidently still believe in voodoo, and to find a dog running around at 18,500 feet, where there is no food and little oxygen, was terrifying to some of these guys. They surrounded the animal, rocks in hand ready to slay the devil, but Lema fabricated a story about the dog belonging to one of the park rangers and managed to defuse the situation. On day 6, the tough day up the Western Breach, we found out at lunch that a disaster had been barely averted. We all had to wear helmets throughout the day because of the potential of falling rocks, and coming up the Breach behind us the porter who was carrying our huge mess tent on his head had looked up to see a rock headed straight for him. He ducked in time and managed to maintain his balance, but the rock hit the bag, and the bag took off down the glacier. 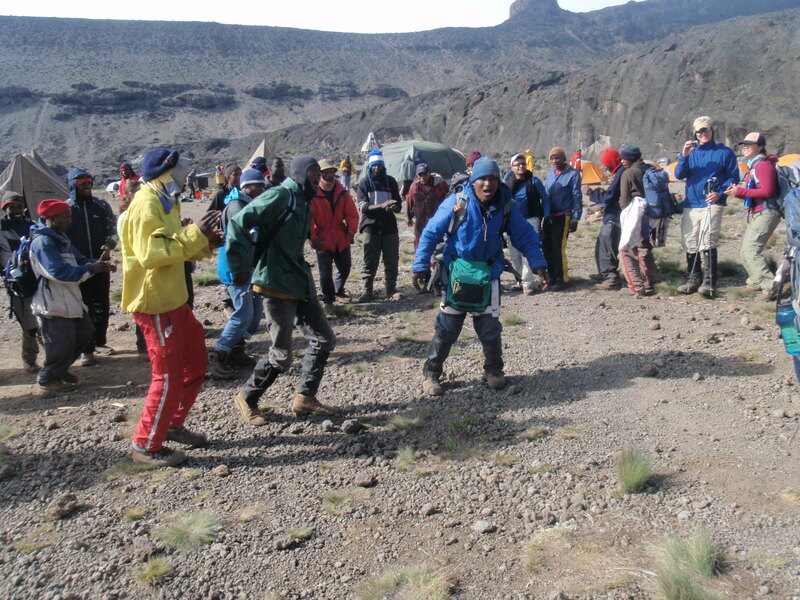 To his credit Lema accompanied several porters back down 1000 feet or so to retrieve it, and they were an exhausted group when they finally arrived at the Crater Camp at 18,500 feet. But that night the mess tent was up and open for business, right on schedule. Lema did tell us a story about one client who didn’t make it to the summit. She was a 75-year-old woman who showed up with a duffle bag so heavy it required two porters to carry it, walking in tandem. The heaviest item in the duffle was a huge make-up case, and every morning the group would wait around and leave 90 minutes late because this woman had to work on her face. To her credit she made it to 16,000 feet before calling it quits and heading back down, unsuccessful in her summit attempt but looking damn good. 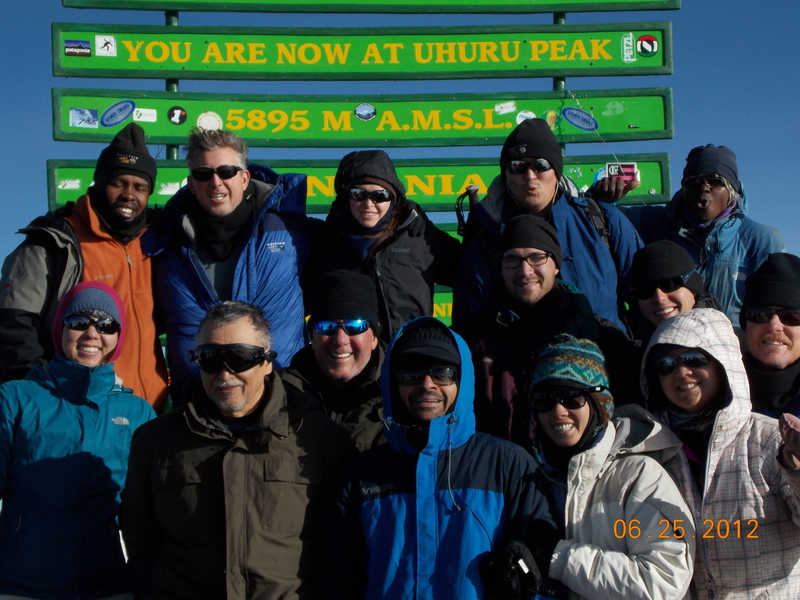 I love the picture of our whole group at the summit. That was such a special moment for all of us individually, but it was also rewarding to have everyone else make it. We’d been through a lot together, everyone had been supportive of one another, and it made the accomplishment more meaningful to succeed as a team. I mentioned Ken Lee (who “Tebowed” in front of the sign for a friend who is a Jets fan) and Russ and Brent Wilde from Australia. We had the cheerful, always smiling Canadian sisters Audrey and Levana Pang; K.J. Singh, a native of India who is now a consultant in D.C. and his climbing buddy Grant Morris, recently retired at 49 and living in Arlington, Texas; Michael Coutinho and Kim Huynh, a really nice young couple from San Francisco; Rachael Patterson, a pretty med student from Chicago, always upbeat and positive and medication-knowledgeable; and Justin Henderson, a tall and very engaging recent business school graduate who won’t mind if he never again sees an open can of sardines. It was a diverse group that got along remarkably well, and I will not forget them. Great accomplishment (and report) – congratulations! Your time on the StairMaster at The Lodge and the classes you took on English composition at Duke are really paying off… enjoyed your post! Ruf, we are really enjoying this. Glad you are having a good time. Take care of yourself. We celebrated July 4th with friends and family nd extreme heat! – have to say that Sawgrass CC did an outstanding job this year by surpassing all other fireworks’ events – they were really, realy good. The kids loved it and you know me, fireworks was my most favorite part of the WGV “Friday Fest”. In fact, interestingly enough, one of my new golfing buddies and I were talking about plans for this year’s 4th and she mentioned they always loved going to WGV on Fridays for the music and fireworks…small world, eh? Looking forward to your next blog – stay well and safe.